That girl loves to swim. So when my parents got a new boat, no one was more excited than Dallas. She couldn’t wait to jump off the boat into the water. But while it was easy to get her off of the boat, getting her back on to the boat was a bit of a problem. Enter my clever dad. 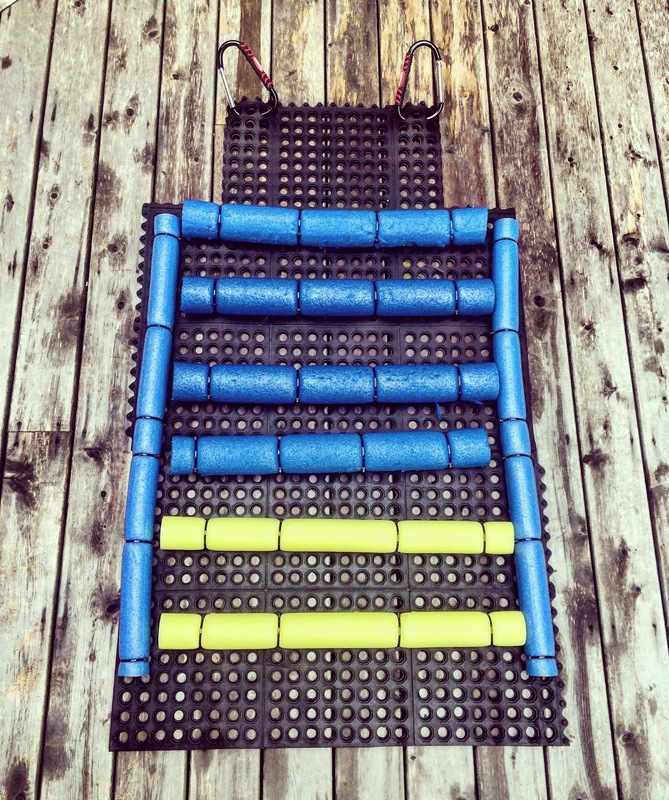 After doing some online research, he decided to make a floating ramp-like device that Dallas could use to climb out of the water and on to the boat (or dock). It was so easy, and worked so well (after a few modifications), that I couldn’t wait to share this idea with all of you. Plus it only cost about $30 to make. Score. 1. Place the mats face-up. 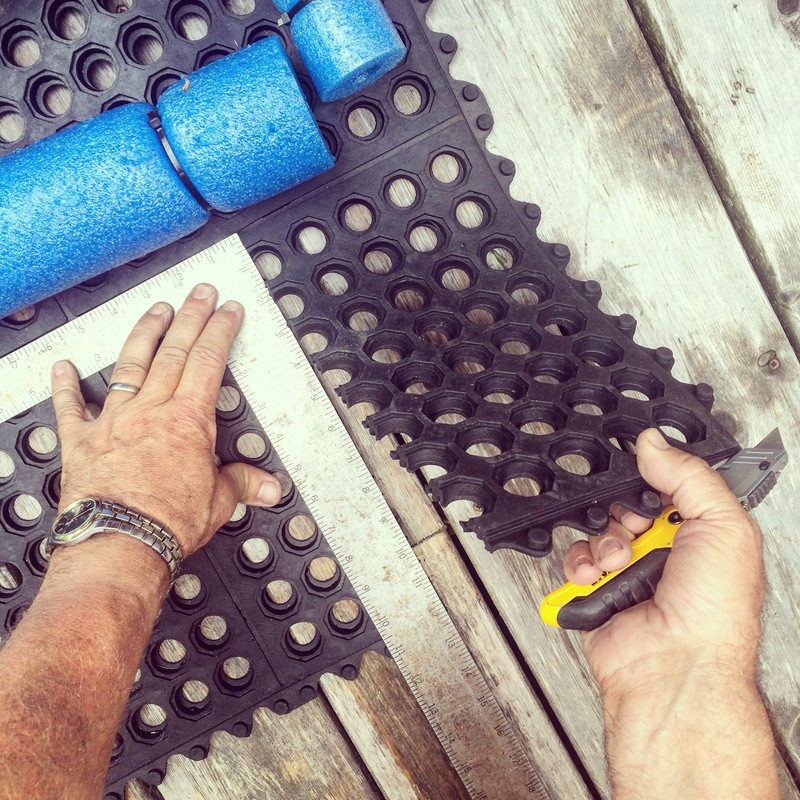 Note: When you’re done attaching the pool noodles to the top side of the mats, you’ll flip the whole thing over so that the bottom of the mats become the top surface of the ramp. This is intentional because it means that the “grippiest” side, i.e. 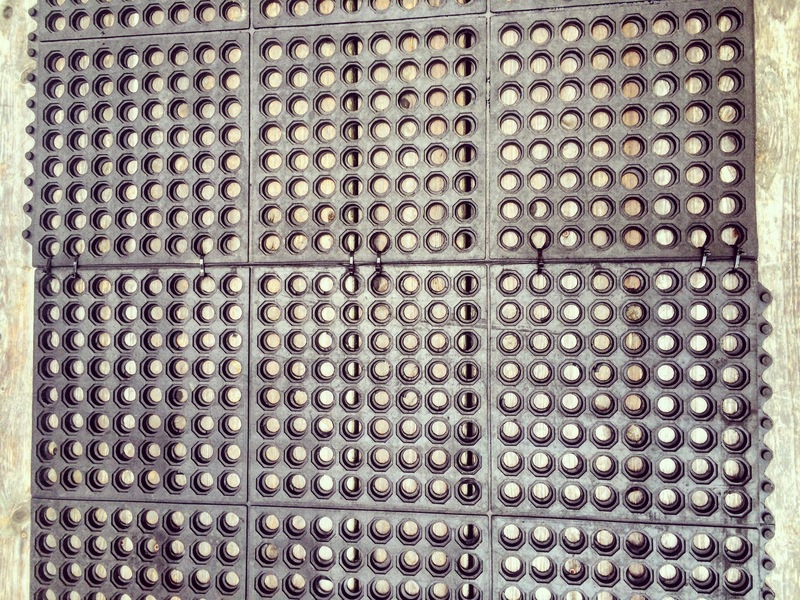 the bottom of the mats, is on top. 2. 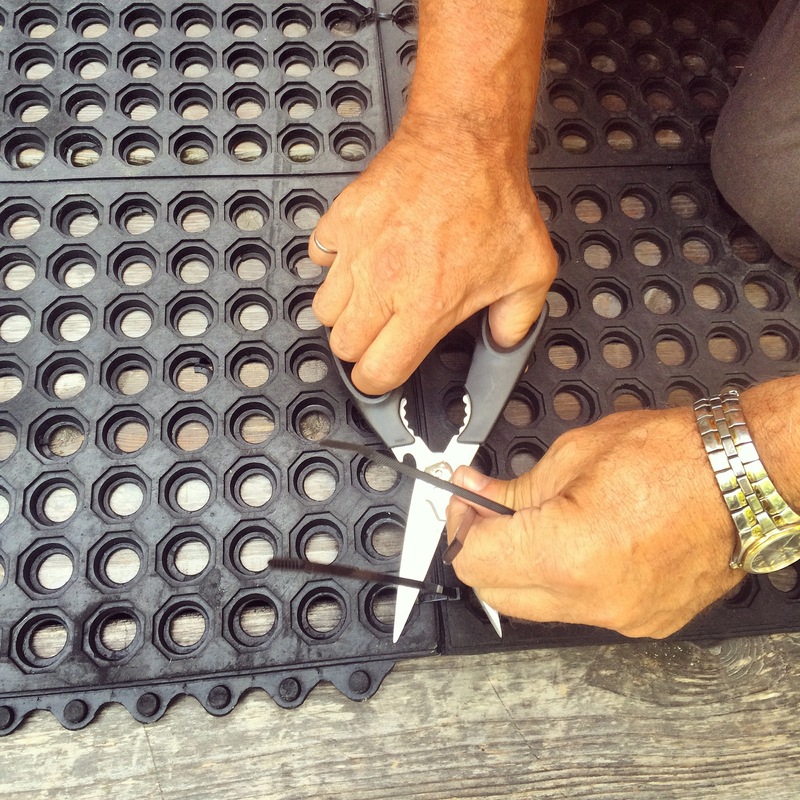 Using 8 zip ties, attach the mats together along the long edges. You can attach the zip ties however you like, but we recommend putting 2 on each side, 2 in the middle, and 1 in between the middle and each side (see below). You will end up with a large surface that is 3′ x 5′. Note: Always trim the ends of the zip ties with scissors. 3. 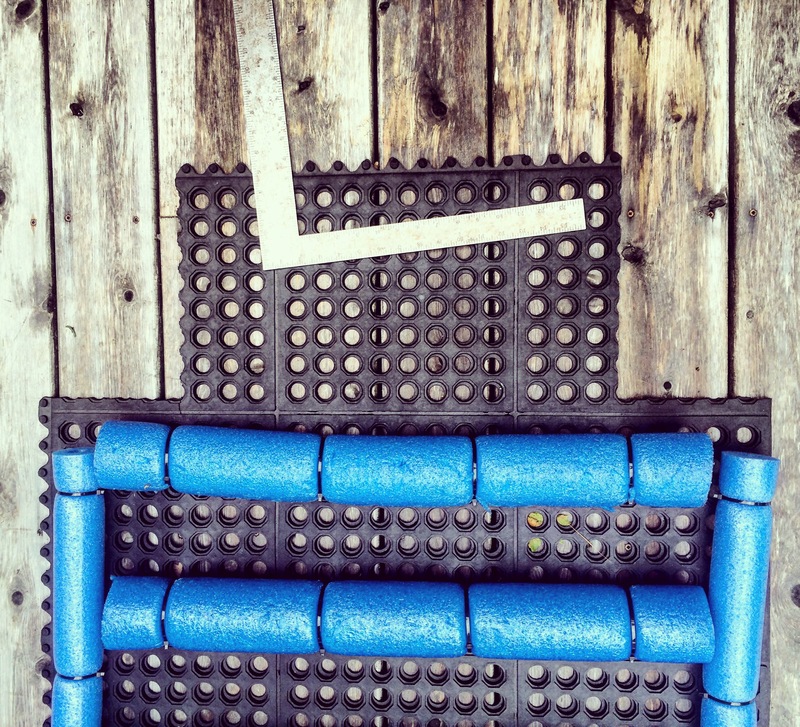 Using more zip ties, attach the 2 uncut skinny pool noodles to the long edges of the ramp. 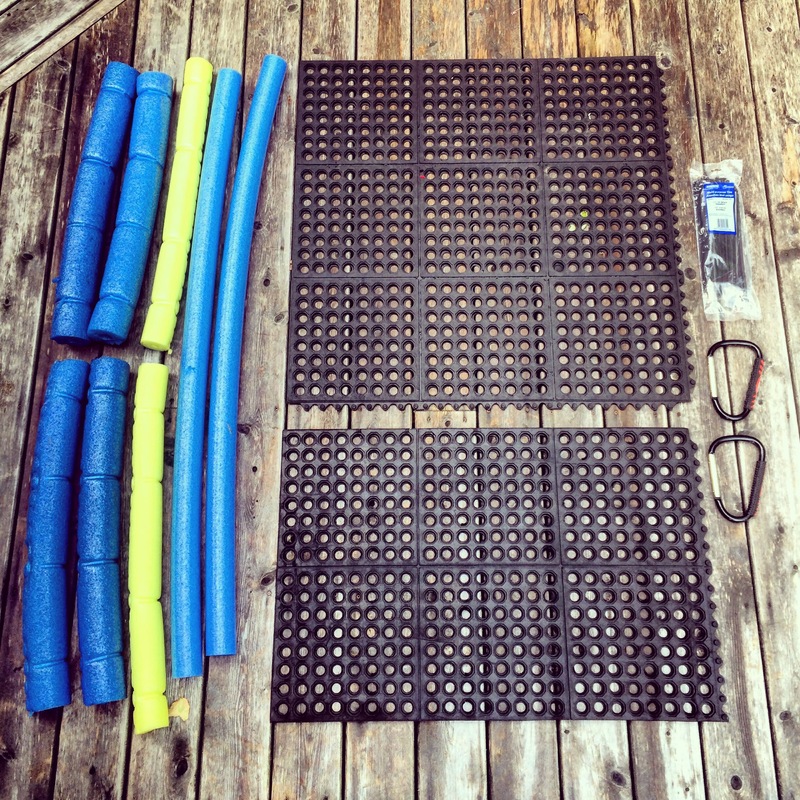 We used 6 zip ties for each pool noodle. Leave a space of about 6 inches from the bottom end (the water end) of the ramp. 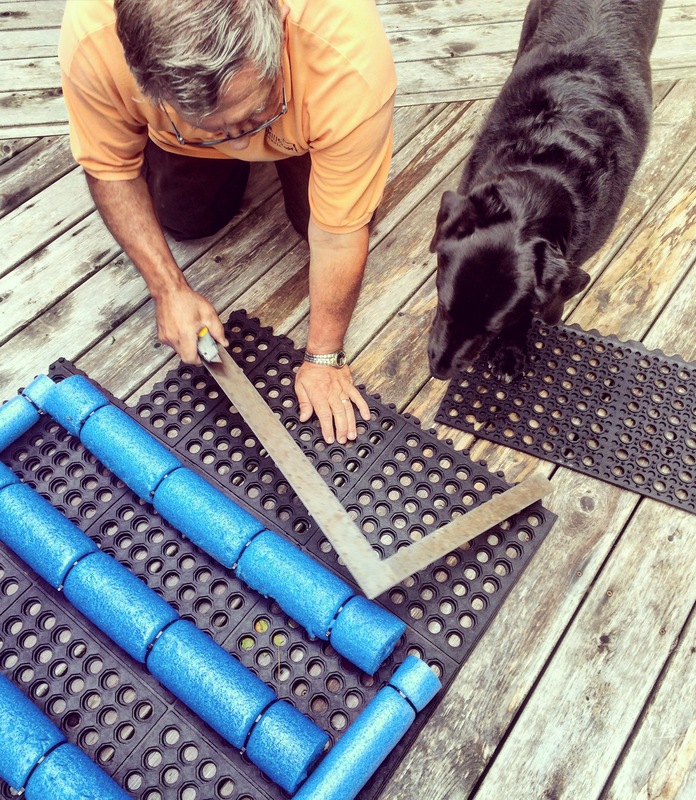 This allows the end of the ramp to sink down into the water a bit, making it easier for your dog to climb up. Make sure to also leave a space of about 1 foot from the top end of the ramp (you’ll understand why later on). 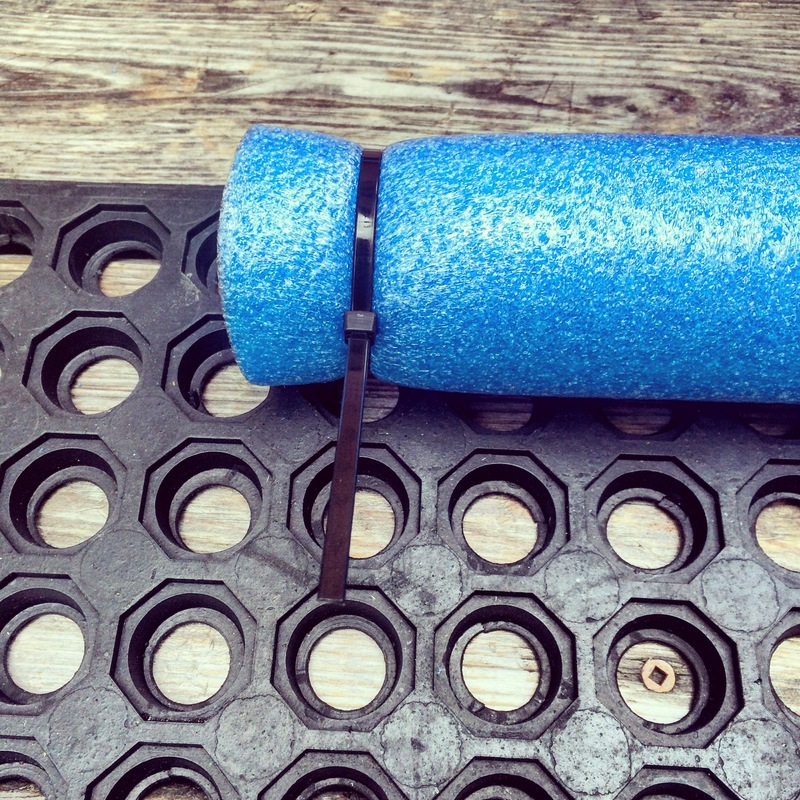 If necessary, trim the pool noodles to fit. Note: These 2 side noodles are a modification from our first failed attempt at making the ramp. Without these reinforcements on each side, the bottom half of the ramp will flip under the top half. 4. 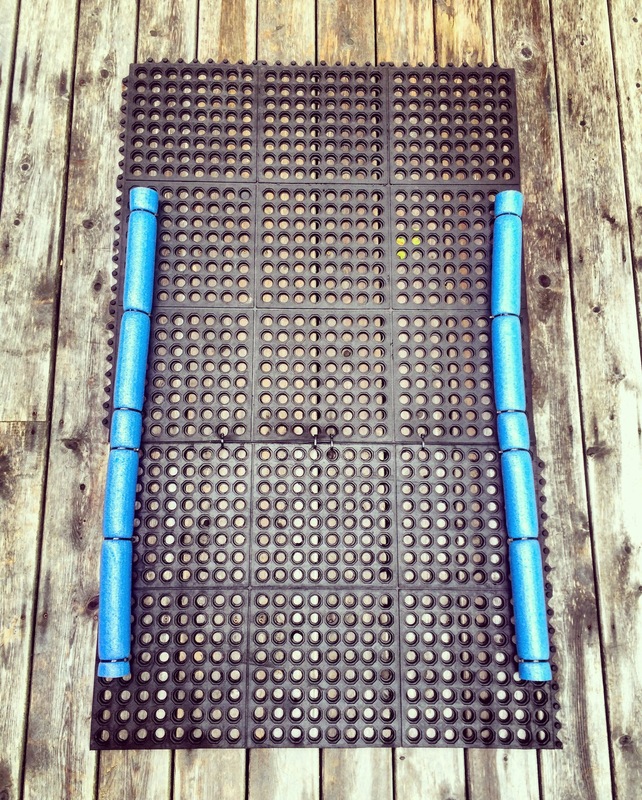 Attach the 4 thick pool noodle pieces to the inside of the ramp, in between and perpendicular to the side noodles. Keep them evenly spaced and towards the top end of the ramp. 5. 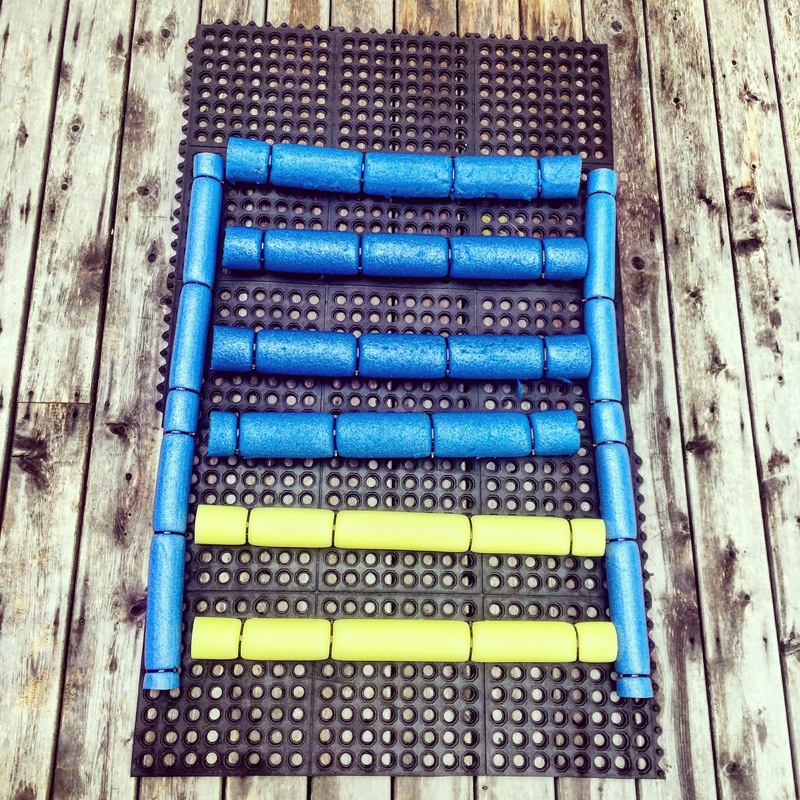 Attach the two skinny pool noodle pieces towards the bottom end of the ramp. 6. Measure the width of your dock or boat ladder, and using a box cutter, trim the top end of the ramp so that it will fit in between the rails of the ladder. We do not recommend doing it this way. 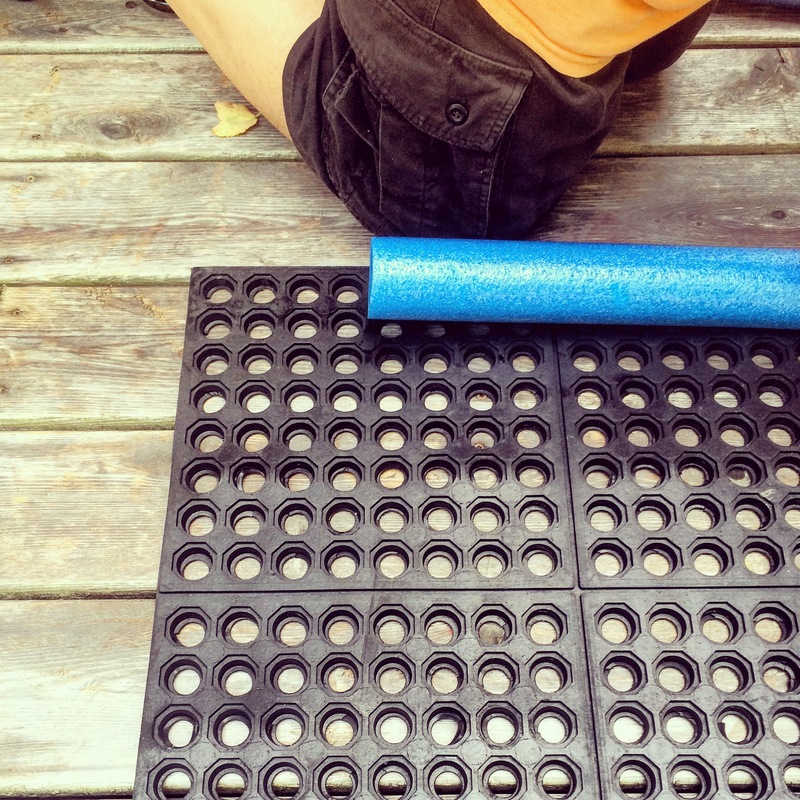 When Dallas used the ramp, the carabiners quickly started to tear through the rubber mat. Hence the addition of rope. On each side of the ramp, weave the rope in between the holes in the mat, and attach the carabiners to the rope instead of the mat (see below). This worked much better. And by using carabiners instead of simply tying the ramp to the ladder, the ramp can be easily moved in and out of place, from the dock to the boat and back again. Oh what fun. Vern is our lab/pit mix swimming buddy and we are trying to teach him to climb the stairs but he struggles! I am in my way yo the store to get this stuff to help him out!!! That’s an awesome idea, thanks for posting! I have the supplies to build a ramp for my in ground pool. We have a 6 pound poodle. Wonderful idea! They are too expensive to buy. Definitely a market for an affordable dog ramp! The mat we bought looks just like yours. It’s very heavy and stinks like a tire. I hope I got the right thing; it seems like it may be too heavy. We are going to hook it to the ladder with spring links and rope and attach a solar light for night time. He’s not a big swimmer, but he knows how. I just want to make sure he is safe. How do you think this will work on a boat dock in saltwater? I have a 55 lb. Aussie who loves jumping off the dock and swimming. Hard to get her back out of the water and avoiding oyster beds which could cut her paws. Hi Carol, we have used it on a boat dock in a lake (not saltwater) but I expect it would work just as well. Good luck! 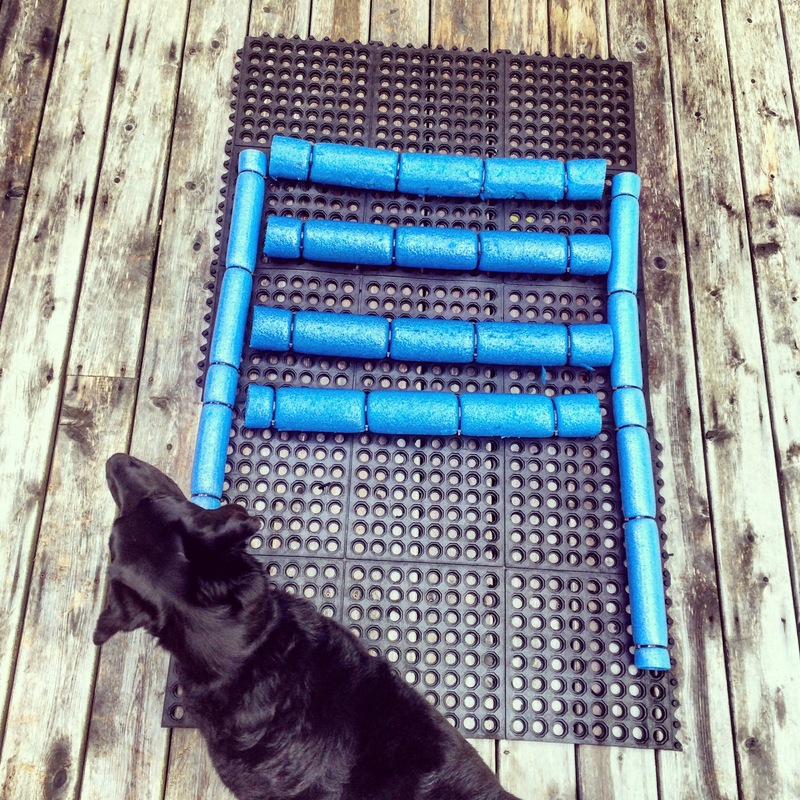 Love your dog ramp idea! I am the new owner of an old…ahem, I mean classic sailboat and I need my first mate! We will be sailing in your backyard, navigating the great Lake Ontario! I do have a concern because my matey is missing a peg leg….so with 3, I want to ensure it’s an easy hop up into the boat! Thanks for the idea and inpiration! Keep up the doggone good work! I just completed building this floating ramp (with modifications) for my five rescued companion – a number of whom are aged, infirm, and maimed (missing limbs). We anchor the pontoon mid-lake, and – equipped with canine flotation vests – they all take turns funning of the deck and leaping into the water. 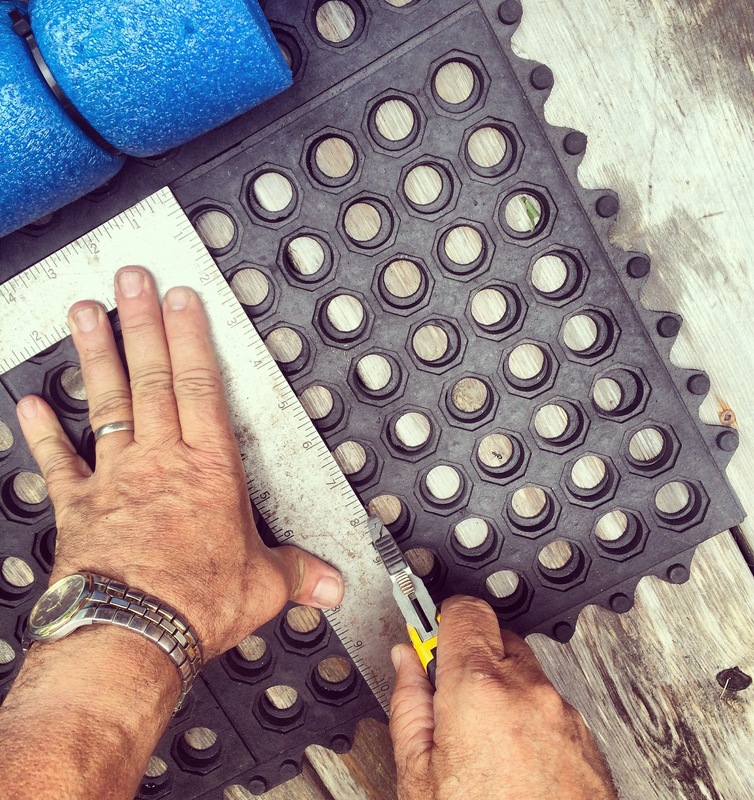 In order to maintain the use of our ladder, I elected to mount my anchor points on the foredeck – and added additional large noodles under the mats (two 3’x 3″), adding 1/2 of a short noodle to the top, as a visual cue for them to approach the boat. I wove a 15′ mooring line down each side and across the mats (midway), to distribute the stress throughout the ramp… and added surface mounted “cups” with cleats for anchors… employing 76 zip ties in all. With materials purchased at Menard’s (two 3X3 mats, noodles, mooring line, carabiners), stainless steel mounting hardware, and using my own substantial supply of zip ties… the total came to @ $90.00… WELL under the $400+ the closest commercial alternative would cost! Love your idea and thanks for sharing. We have 90 lb black lab. We take your suggestion and add extra flotation. We will have to adapt as it’s for a bayliner boat, not a pontoon. Any suggestions ? Hi Claudia, I would just recommend adding as much extra floatation as you can get on there – we find the float sinks quite a bit when Dallas is climbing on. Good luck! This rocks! I have been searching the internet for a cost effective ramp for our dog and am so glad we came across this. Thanks for posting! Just happy to share an idea that works! Good luck with it. I hope your dog loves it. Regarding the ingenious floating dog ramp, how much does Dallas weigh? I want to make one for my 80 lb chocolate lab. Hi Gary! Dallas weighs 65 lbs so you may want to add some more floatation. Hope this helps. What great fun it was to design and test this with you and Dallas!